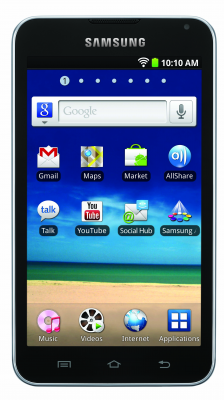 Samsung’s Android-Based Answer to the iPod Touch Finally Headed to U.S.
After shipping models elsewhere for some time, Samsung is finally ready to bring its Wi-Fi-based Galaxy Player line of products to the U.S. The devices, which are to the Samsung Galaxy line of phones what the iPod touch is to the iPhone, will hit retail shelves on Oct. 16. A model with a five-inch screen will sell for $269, while a similar device with a four-inch screen is priced at $229. Both include a 3.2 megapixel rear camera, a VGA front camera and eight gigabytes of memory, which can be expanded with a microSD card. The five-inch model weighs just over six ounces, while the four-inch model weighs 4.27 ounces; the former has a significantly larger battery. Samsung showed the devices at the CTIA trade show in Orlando in March and said then that it expected the devices to ship in May. The Wi-Fi models represent an interesting option for those looking to try Android without committing to a phone (and accompanying two-year contract). While the iPod touch has clearly found a significant market, it is unclear how large the demand is on the Android side of things. Also yet to be seen is if these products, like other Android models from Samsung, draw the ire of Apple’s legal department.